So, When Does the Knicks Honeymoon End? 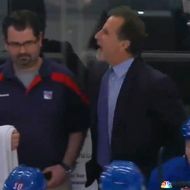 Last night, after the Rangers and Devils finished up their game-opening line brawl, the NBC Sports Network showed video of John Tortorella yelling in the direction of the Devils bench, and a bit of lip reading suggests he wasn't reciting Shakespeare. During his post-game interview, Tortorella wouldn't comment about Devils coach Peter DeBoer's starting lineup; in fact, he didn't even acknowledge that he'd screamed at anyone, despite the video evidence. DeBoer, on the other hand, did share his thoughts about Tortorella's reaction last night. “I guess in John’s world you can come into our building and start your tough guys, but we can’t do the same in here. He’s either got short-term memory loss or he’s a hypocrite. So it’s one or the other,” DeBoer said. See, this isn't the first time these teams have fought in the opening seconds of a game this season. Back on December 20, Tortorella started his fourth line for a game at the Prudential Center, and DeBoer did the same. Three seconds into the game, Mike Rupp and Can Janssen dropped the gloves. Then back on February 7 at the Garden — a game in which DeBoer, as the visiting coach, set his starting lineup first — a pair of fights broke out as soon as the puck was dropped to begin the game: Rupp squared off with Janssen, while Brandon Prust took on Eric Boulton. "I think Peter needs to jog his memory as far as starting lineups I have put in over in his building, and really, basically, just shut up," said Tortorella. "And I need to, also. I think the situation last night is disrespectful to the players, and I think we took a backwards step. I get put in a position, when he puts a lineup like that out, and I don't know what's going to happen if I put my top players out, so I have to answer the way I think I need to answer. Really, just look at the two lineups and some of the things he has done here. I don't want to coach his team, but just shut up." At it's core, this is a debate about whether staged fights have a place in the NHL. (Tortorella, as you'd imagine, doesn't think so. Said Torts, also via Blueshirts United: "Fighting is a big part of the game, but it doesn't need to be manufactured," adding, "It's really gotten old for me, the staged fights. That crap at the beginning of the game, to try and manipulate it into it. I just don't think it's right for the game.") As far as DeBoer is concerned, also at issue is whether Tortorella himself helped initiate such a fight through his choice of a starting lineup earlier in the season. And so if DeBoer's comments last night were the verbal equivalent of a punch, consider Tortorella's response today a counterpunch.